A perfect alternative for nature lovers, Centre Point Langsuan is connected to major financial districts of Silom and Sathon Road while situated in the green atmosphere of Lumpini Natural Park, and a few minutes away from Siam Square where fashion wise eternally moves. 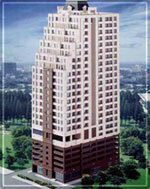 Centre Point Langsuan is an ideal residence for executives who demand an uncompromisingly high standard of living. When it's time to relax, you can start with a vigorous workout at the health club, followed by a sauna and a dip in the swimming and sunbathing terrace pool. If you prefer quieter relaxation, enjoy the tranquility of the reading room, or greet your friends or colleagues in the privacy guest reception room for business or before dining together in its own excellent restaurant. A mini-mart and laundry service are also located in centre point for your convenience. Modern facilities cater to your individual needs and lifestyle.